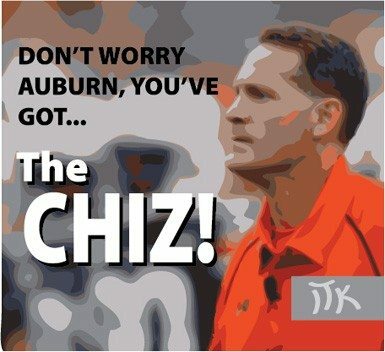 Gene Chizik wants you to think know his team isn’t a bunch of puds. Build on the concept of physicality? What the fart does that mean? Do Auburn’s players not know that football is a physical game? Birmingham News flunky, errrr, lifetime Auburn beatwriter Charles Goldberg actually wrote in his update that Auburn “got to play tackle football” in Monday’s practice. I just cannot imagine, for a millisecond, Alabama head coach Nick Saban ever having to stress the “physicality of the game” to his players. Not if he were entering his fourth season. After a shaky first year, under Nick Saban Alabama’s identity has been being the team he envisioned in his opening presser on a cold January 2007 day. A team you don’t want to play, with the kind of nasty, physical presence that makes the other team keep an eye on the scoreboard clock, hoping double zeros get there sooner than later. But then again, Chiznik is the coach who let the “dipsy-doo, trickeroo” offense live on his campus for the first three years of his head coaching tenure. Where Onterio McCaleb learned to sprint out of bounds. Where the object of the offense was to snap the next play before the defense was ready. Where tomfoolery was the foundation of an offense built for intramural fields everywhere. Now, four seasons in, Chiznik is in the midst of rebuilding the identity of the Auburn football program. Across the state, Nick Saban is in his sixth season. You know what has changed in his coaching philosophy since day one? Hence, I give you reason #394 I’m thankful Nick Saban is in Tuscaloosa, and Frank Chiznik is in Lee County. Just one word of advice for the Chiz. If you want your team to be physical, stop dressing them like ballerinas on the practice field. Trouble brewing in Memphis for Auburn? Aubsession. The smell is intoxicating. When you give us so much material to laugh at, why in the world would we ignore it? I think hillbillies who troll rival websites are obsessed. You’re not going to change our mind about that nasty backwards University, and we’re not going to censor what we write about trashy Universities either. Our opinion that AU ppl are a bunch of hypocritical mud dogs should not insult you unless you’re a mud dog too. For what it’s worth, I kinda hope they do start playing straight-up football. I don’t like the hurry-up game at Auburn. They did a little hurry-up last year at Clemson, but it wasn’t tricky so much as it was designed explicitly to execute more plays per game. Auburn’s hurry-up offense was always designed as more of a magic trick than a clock issue. I’m not calling anyone names here, I just don’t like the way they ran the hurry-up. I would rather face a more traditional style football rival and play face-to-face, man-up football. I’m hopeful, but not yet completely convinced. Do you mean the hurry up and punt offense? In a related story: Cheez-dik actually spells “physicality” “fizzakalaty”. It’s the tiger way. Even tho I’m old enough to be one of those kids grandma I sure do like there new practice shorts. From the back of course. Just wanted to be one of the first to say im sorry to hear about your impending NCAA investigation. Well, not really. Im not sorry to hear it at all. Good luck with it. And remember; you’re in the repeat violator window! Sampson has to do all of his talking now, for when the season starts, he won’t have a lot to say. It is fun to watch the anticipation of the Auburn fans build up this season. They are really trying to convince themselves that Auburn and the the Chizz have done enough in the off season to catch up with Saban and Bama. The disappointment to follow is going to make this season really satisfying to watch play out. This will be the year Chiz starts out the door, and Auburn fans will be crying for Patrino by October. Fiction is fun, ain’t it sampson? Delusion: A Barner’s best friend! HA! I tracked down what you’re pinning your hopes on. You have a better chance of winning the lottery. I wouldn’t count on transfer issues when the NCAA is already hot on the trail of Reuben Foster’s mom getting that job mysteriously. I know this personally, friend. Sampson what’s AU done now? Check out Gene Jismpants system for signaling in plays. This year’s edition includes Charlie Sheen and Nick Saban in his underwear. Are his players too stupid to learn a playbook? The truth is stranger than fiction where the barntarded are concerned. i remember a couple of years ago when they’d hold up a pic of Obama, Cam would run right. They’d hold up a pic of Bush and Cam would run left. They’d hold up a pic of Superman and Cam would run up the middle. They’d hold up a pic of an airplane and Cam would pass. Ingenious offense really. Bamabino, you do remember that Cam and that offense beat your beloved tide in your own house after being down by 24 freaking points, don’t you? Seemed to be pretty ingenious that day, unless you’re saying that Saban was too stupid to figure out a way to stop a simple minded offense. Fluke game. I remember 3 of the last 4 for Bama and +10 for Bama since the series resumed in 1948. Oh, we remember that loss alright. In fact, we will never forget it. Hence the famous “never again” quote. There’s culture for you. That Auburn Iron Bowl win is one of the most important things to happen to Alabama under Nick Saban. I’m glad Auburn fans enjoy it now, and I hope they can still enjoy it ten years from now when they still haven’t won another Iron Bowl. Here we have an actual newspaper article quoting a high school coach confirming that he has reported potential recruiting violatons to the NCAA. As to Reuben Foster and Auburn, you have tiderinsider message board posts from bama4ever, got14stud, and alfromdadeville. Intheknow, given that you have all this inside knowledge, tell me again where Reuben Foster’s mother is working? Seeing as how you know this stuff “personally”, certainly you can at least tell us what the job is that Auburn supposedly got her. Perhaps you can also tell us where Darius Paige’s mother will be working in her new found hometown of Foley. What was quoted from Coach Pruitt that would be considered an NCAA violation? If anything, I would interpret it as – “You won’t get the academic help at Washington High that you will get at Foley High” – no mention of “Hey, we’re gonna change your grades” or ” We’ve got a fix in for you at Foley” – just that he’d get the academic help he needed at Foley High School. Now, if I was a Boog from API, I might interpret that as “Hey, since your dumb as a rock and committed to the Barn, we’ll get you to this high school where the coach has all kinds of access to you and will influence your teachers to give you the grades you need to qualify”, but if I’m dealing with an athletic department like Bama’s that has a top-notch compliance team, I consider what Coach Pruitt to be saying as “Foley has in place a team of teachers that will help you make the grades you’re going to need to qualify at Alabama”. @Abraham – Since you are a booger-picking goob from Alabama Polytechnic, I can see how you must be staying awake at night with visions of Bama getting nailed by the NCAA so that your high school coach and his high school football program might have some slight chance of eventually beating a Nick Saban-coached Bama team again, but just keep on dreaming. If this is all the Washington High coach has to report, it is dead in the water already. But, you know, keep on dreaming about a win again someday. LMAO@ Abraham. Page already has the NCAA’s blessing. Foster is a differeent animal however. LMAO at both Alabama and Auburn fans. Watching your two, less than brilliant (trying to put that as nicely as I can), fan bases try to destroy each other is priceless! I hope you both succeed in helping get the other in trouble with the NCAA. ITK doesn’t know that info because it doesn’t exist. These rednecks create biased info and pass it amongst themselves long enough to forget where it started …..and then believe it. ITK “knowing” that the NCAA is investigating Foster is akin to RC guaranteeing that NCAA sanctions against Auburn were coming down on 8-31-11. It’s all fiction. Whether RC and ITK made up the story or were duped by other Bammers is no really relevant …at some point rational folks realize that they are being duped. These regular posters at the CR ….aren’t rational. They are just so biased that they grab every and any shred of stuff they can just to make up some dirt about others. It’s a classic sign of low self esteem. When you feel bad about about yourself ….make fun of others. Examples of such can be found on this blog every day. As RC says …..they aren’t going to change. That tells me that they have convinced themselves of their superiority. This would be an example of Bammer Arrogance. Bammer Arrogance ….the anethetic to mask the pain from Bammer Stupidity. That’s OK Hoopty. I know for a FACT that Foster was planning to transfer to a High School near where I live, but didn’t come because a family member couldn’t secure a job on the coaching staff. Weeks later, look at where he ended up. Smells a lot like Cam being shopped to Miss. State, but look where he ended up. But of course, Auburn is just fortunate to get these players without any kind of incentives. Auburn would never bend the rules to secure a recruit, because you tell us so. Bammer is the evil and arrogant ones. Not Auburn. Auburn is the bastion for all that is good and right in the world. And you would never admit the truth, which is typical Auburn Cult mentality. I say good. Now that the transfer has gone to the NCAA, they can tell you it’s legitimate and why. That doesn’t necesarily mean you’ll believe them, but oh well, the NCAA is in charge anyway. Transferring to a school to take real classes (not summer school) and to take 8 classes instead of 6 (which he couldn’t do at the school he transfered from) to prepare for college and raise his GPA should be seen as a good thing. I say it “should” be considered a good thing, but why maximizing your efforts to become academically eligible would be unusual to Auburn fans I suppose makes sense. He can’t take his 8 classes online, if that helps (probably doesn’t). What, you think it’s some kind of cheat? Or do you think it will help him prepare for school at Alabama where he also has to become and remain academically eligible? He didn’t transfer to Tuscaloosa after committing to Auburn or something—-he moved as close as he could (30 miles) to still achieve his goals. I understand the rivalry part, but instead of thinking Alabama’s coaches are looking out for the recruit’s best interests (even if he chooses another school), all you can see is it’s a cheat, and that I don’t understand. You’re blinded by hate. It’s a shame minors get involved in messes like this where too many people choose to ignore the positive and only focus on what they thing is absolutely wrong. See, here’s what you are willfully ignoring, Conduit. I;m not the one accusing Bama of cheating here. A bama commit’s high school coach is accusing bama of cheating. I’m simply pointing out that Darius Paige’s high school coach reported the University of Alabama to the NCCA for alleged recruiting violations. I didn’t say that, the Pensacola News Journal said it. No, you’re not accusing, you’re just agreeing with the accuser, so don’t take it personally because it’s not directed at you, just the people you agree with (?). Even if you think he’s accusing Bama of cheating, which I don’t think he is, they aren’t. If you can’t understand why he’s plssed his star athlete is changing schools, I don’t think cheating is the first place to turn. I think that’s pretty clear though? I kinda learned all that a few weeks ago, there was a recruit who did the same thing named Rueben Foster. He is a big dude, a big commit, it was in the news so it’s easy to find but same thing, only a little more questionable but just as legitimate. Thankfully, if you’re right, the NCAA was told about the whole thing so that they can clear it and we can move on and recognize this is a good thing no matter where this young kid decides to go to school after high school. @Conduit: “Even if you think he’s accusing Bama of cheating, which I don’t think he is…” ARE YOUR FREAKING SERIOUS???? The guy reported bama to the NCAA. You think he just called to tell them he was mad?? And you accuse Auburn fans of being delusional. Priceless. Of course that’s how a guy with the word tide in his screen name would “interpret” it. You believe that Pruitt was simply commenting on the quality of teachers at Foley, as opposed to telling that Paige that he has a longstanding relationship with the coach there that can get him special treatment. Don’t worry, pete. I’m sure that’s exactly what bama will say in their official response to the NCAA. The question is how the NCAA wil “interpret” it. bamabino, Schellang just reported this to the NCAA a few days ago. The NCCA certainlly hasn’t issued a “blessing” on anything, Again, just because something is posted on a message board at tiderinsider doesn’t mean it’s true. Still can’t wait to hear what this job is that Auburn got for Foster’s mother. Ownage. It must be his upbringing. I recall a Penn State fan once saying that about Joe Paterno’s program. In the end it was that same attitude and mentality that burnt the Penn State program. Yes Sandusky’s actions might have been the spark, but it was this exact type of attitude about it’s program that allowed it to burn. I guess the only thing I don’t understand is why you think it’s wrong for Alabama to do it but it’s not wrong for Auburn to do it, particularly when Auburn moved their recruit to Auburn itself after he had verbally committed to Alabama. I don’t think either one is at all outside the rules, but if you’re gonna cry foul there’s a difference between running down the first-base line and a pop-fly behind the catcher. Special treatment? Is that what you think? Who said anything about special treatment? Specifically they said more relevant details, like being able to take 8 classes instead of 6, that doesn’t sound special, it sounds harder? Is it more special than giving an assistant coach unlimited access to a recruit who is already verbally committed to another school? I think you’re shooting yourself in the foot here? Your hate for Alabama is clouding your judgement, but you just haven’t thought it through. The NCAA will interpret it the same way because it’s already allowed? I don’t understand what rules you’re trying to suggest Alabama was breaking here and consequently Auburn wasn’t? @Conduit…”I don’t understand what rules you’re trying to suggest Alabama was breaking here”…Once again, I’m not suggesting anything. The former high school coach of a current bama commit is the one suggesting it. RC, I still want to know what color the sky is this fantasy world you have created. First of all, the al.com article was written by Josh Bean. Secondly, the articles does not in any shape, form, or fashion say that the NCAA told the coach there was no violation. Bean himself stated in the article that “it appears there is no NCAA rule prohibiting a college coach from recommending that a prospect switch high schools.” I couldn’t agree more. Directing a kid to school so he can get “special treatment” with his grades (as the Washington coach was obvioulsy implying), definitely a violation. But see, you’re the one saying the “special treatment” part? You’re right though, if it’s for some “special treatment” like online classes or free economic class “A” grades or something it’s definitely a violation. Should be real easy for the NCAA to find if that’s true or not, right? This must be the class you have failed many times. Talk about the pot calling the kettle black, as many times as you have demonstrated very poor reading and choprehension skills on this site it is laughable for you of all people to be making such a comment. Maybe you and the Conduit can take the class together. We’ll obviously have a better chance at getting an “A” then you will in Spelling Class. WTH was that? That wasn’t even a TYPO?? Really ? Scroll down the blog at all the articles accusing AU of “alledged” accusations……And you wonder why ? Really ? It is a great Auburn Tradition accusing Bama of cheating, and tales of an all-powerful Bama secret agent organization are legendary. Some rumors and myths that Auburn fans have been telling each other go back 30-40 years now. But let Bama fans accuse Auburn of something, and it produces people like Hoopty and Ballplay here calling the kettle black. We know you guys wish that Bama would get in trouble. Heck, you guys practically pray for it in every waking moment. We don’t really have to worry about Auburn getting in trouble. I would rather just watch Bama’s Saban coached teams beat the crap out of a full-strength Auburn teams every year. They have already produced some of the worse beat downs that Auburn has seen in the iron bowl, and we all know that another one is coming this season as well.